Jessica Hamill departed for Beijing on 28 May to compete in a competition called the “Good Luck Games”. It is a very popular event as most athletes use it as a warm up competition before the Olympics. Jess went for the experience, to see what Beijing was like, and how she would perform with the Beijing pollution, smog and heat. Her events were held at the national stadium which is known as the birds nest. 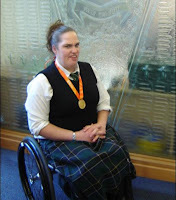 Jess competed in the shot put event receiving a Gold medal. With her throw of 7.12 metres she achieved a New Zealand record, an Oceania record, as well as recording a personal best. With this win giving her confidence, Jess is looking forward to the Paralympics where she will compete in Shot Put, Discus and Javelin. She is training hard and is on track to record more personal bests. When asked how she liked Beijing, she said “I liked the City, but it was dirty and very busy, but it does have very very good shopping!” Well done Jessica.